The world of ready-to-wear fashion means must-have accessories are going from catwalk to street style faster than you can make room in your jewellery box. The perfect example of this was the bold neon jewellery created for Jeremy Scott’s Fall 16 RTW runway by New York’s Alexis Bittar. 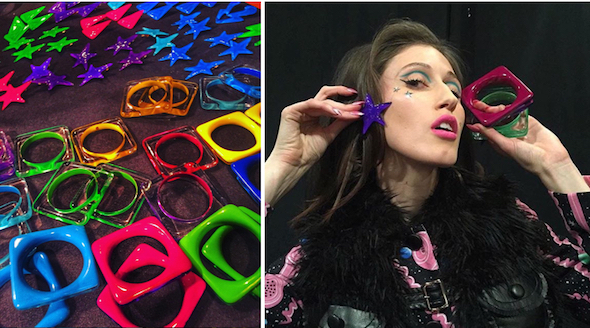 Within a few hours of the NYFW catwalk show – imagine Nashville and Pop Art crash landed in a poodle parlour – their collaborative collection of Lucite bangles, angular hoops and bulbous rings landed online, ready for fashion fans to snap up, dress up and splash across Instagram. How smart is that? Showcase a collection for next season, but launch jewellery for this season immediately after. I love this way of working. It proves that fashion can be accessible to all, especially the wacky world of Jeremy Scott, who not only streamed his Fall 16 runway live online, but has previously cast his cartoon vibrancy over Adidas high-tops and Longchamp Le Pliages.